Russian scholar; born at Skvira, government of Kiev, on Aug. 5, 1856. His father, Isaiah, belonged to a family of Ḥasidim and brought up his son as a Ḥasid. Ginzberg studied Talmud in a ḥeder, and when only eight years of age acquired, unknown to his parents, the Russian and German alphabets from boys of his own age. In 1868 his father became the tax-farmer of the village of Gopishitza, government of Kiev, where the entire family, with short interruptions, lived until 1886. During the time he lived there Ginzberg continued to study the Talmud and the allied literature; he became so well versed in rabbinical matters that the rabbis of the surrounding towns habitually consulted him. He also studied the works of the Spanish philosophers. In 1873, before he had attained his eighteenth year, he married, his wife being a relative of Menahem Mendel, rabbi of Linbavich, and of Jacob Israel, rabbi of Cherkasi. At that time he had become more or less imbued with the critical spirit. In 1878, during a visit to Odessa, he became acquainted with the works of such Russian critics as Pisarev and others. About this time he took up the study of Latin, mathematics, history, and geography. In 1882 he went to Vienna, and in 1883-84 to Berlin and Breslau; but, urged by his wife and parents, he soon returned to Gopishitza. In 1884 Ginzberg entered upon a new phase of activity, one dominated by public and literary interests. In April, 1884, he revisited Odessa, the center of the Chovevei Zion organization, and was elected a member of its central committee, under the presidency of Dr. Pinsker. Ginzberg soon became one of its guiding members. In 1885 he returned to Gopishitza for a short time, and in 1886 be settled permanently in Odessa. In 1889 his first article, "Lo Zeh ha-Derek," appeared in "Ha - Meliẓ." The ideas contained in this article are embodied in the Zionist League (Bene Mosheh) founded by him in the same year. The character and the aim of that league are elaborated in his "Derek ha-Ḥayyim," which appeared in the pamphlet "Sefer Kenisat ha-Ḥaberim" (Jerusalem, 1891). The league lasted eight years (1889-97), and almost all the notable Chovevei Zionists were members of it, Ginzberg being its chief. It occupied itself with the improvement of Hebrew education, with the dissemination of Hebrew literature, and with the interests of the Palestinian settlements. 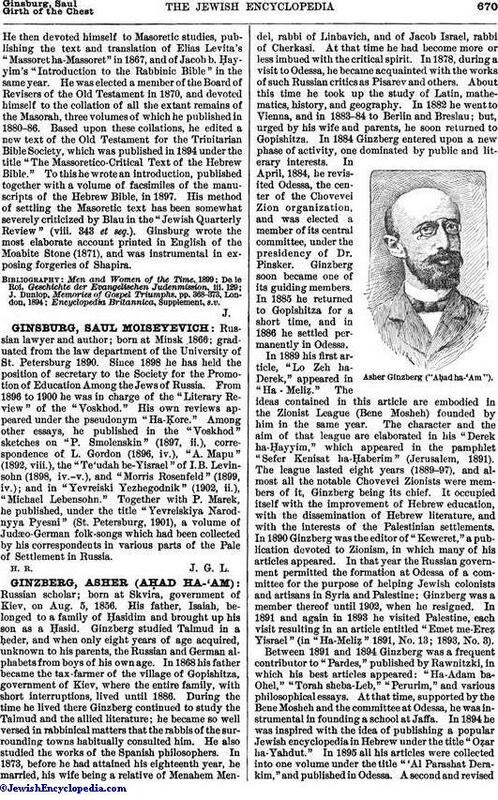 In 1890 Ginzberg was the editor of "Keweret," a publication devoted to Zionism, in which many of his articles appeared. In that year the Russian government permitted the formation at Odessa of a committee for the purpose of helping Jewish colonists and artisans in Syria and Palestine; Ginzberg was a member thereof until 1902, when he resigned. In 1891 and again in 1893 he visited Palestine, each visit resulting in an article entitled "Emet me-Ereẓ Yisrael" (in "Ha-Meliẓ" 1891, No. 13; 1893, No. 3). Between 1891 and 1894 Ginzberg was a frequent contributor to "Pardes," published by Rawnitzki, in which his best articles appeared: "Ha-Adam ba-Ohel," "Torah sheba-Leb," "Perurim," and various philosophical essays. At that time, supported by the Bene Mosheh and the committee at Odessa, he was instrumental in founding a school at Jaffa. In 1894 he was inspired with the idea of publishing a popular Jewish encyclopedia in Hebrew under the title "Oẓar ha-Yahdut." In 1895 all his articles were collected into one volume under the title "'Al Parashat Derakim," and published in Odessa. A second and revisededition was published by the Aḥiasaf Society in 1902 (Berlin). Many of these articles have been translated into Russian by Vasilevski, Sheinkin, Jaffe, Landsman, and Klausner, and into German by Friedländer and Berkovich. In 1896 Ginzberg was invited to Warsaw by the Aḥiasaf Society, and became one of its directors; he also modified and enlarged its program. In 1896 he became editor of "Ha-Shiloaḥ," a monthly magazine still under his direction. In August, 1897, he took part in the Zionist Congress of Basel, but opposed most of the ideas expressed by Dr. Herzl. 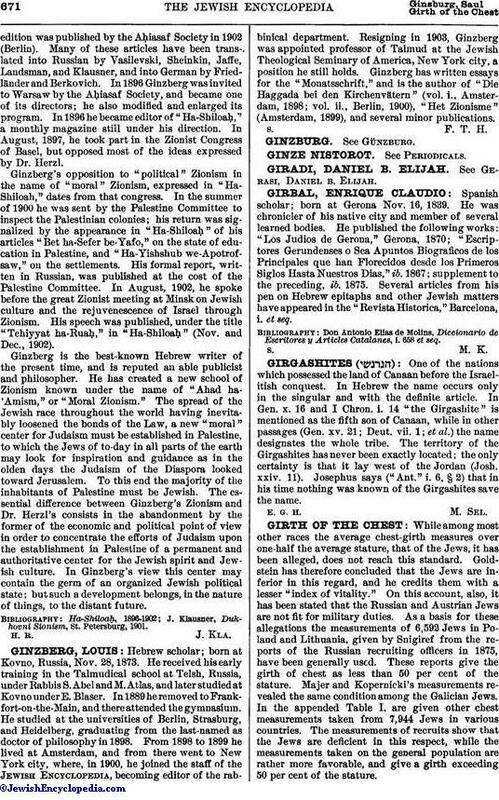 Ginzberg's opposition to "political" Zionism in the name of "moral" Zionism, expressed in "Ha-Shiloaḥ," dates from that congress. In the summer of 1900 he was sent by the Palestine Committee to inspect the Palestinian colonies; his return was signalized by the appearance in Ha-Shiloaḥ" of his articles "Bet ha-Sefer be-Yafo, on the state of education in Palestine, and "Ha-Yishshub we-Apotrofsaw," on the settlements. His formal report, written in Russian, was published at the cost of the Palestine Committee. In August, 1902, he spoke before the great Zionist meeting at Minsk on Jewish culture and the rejuvenescence of Israel through Zionism. His speech was published, under the title "Teḥiyyat ha-Ruaḥ," in "Ha-Shiloaḥ" (Nov. and Dec., 1902). Ginzberg is the best-known Hebrew writer of the present time, and is reputed an able publicist and philosopher. He has created a new school of Zionism known under the name of "Aḥad ha-'Amism," or "Moral Zionism." The spread of the Jewish race throughout the world having inevitably loosened the bonds of the Law, a new "moral" center for Judaism must be established in Palestine, to which the Jews of to-day in all parts of the earth may look for inspiration and guidance as in the olden days the Judaism of the Diaspora looked toward Jerusalem. To this end the majority of the inhabitants of Palestine must be Jewish. The essential difference between Ginzberg's Zionism and Dr. Herzl's consists in the abandonment by the former of the economic and political point of view in order to concentrate the efforts of Judaism upon the establishment in Palestine of a permanent and authoritative center for the Jewish spirit and Jewish culture. In Ginzberg's view this center may contain the germ of an organized Jewish political state; but such a development belongs, in the nature of things, to the distant future. J. Klausner, Dukhovni Sionism, St. Petersburg, 1901.